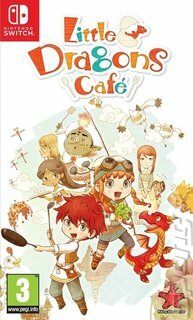 Finally, a game that combines raising a dragon with running a cafe! Yes, OK, you probably didn't know you were waiting for Little Dragon Cafe, but plenty of fans will be extremely happy to have a new game from the creator of JRPG/farming mash up Harvest Moon, Yasuhiro Wada. Things start with a twin brother and sister running a small cafe with their mother. When they wake one morning to find her in a coma, however, a wizard appears and tells them they must raise a dragon to wake her up. Obviously. Then he moves in. Obviously. So it is that you end up balancing your cafe with raising a dragon and trying to find out what it is that's actually up with your mother. You'll explore the world, gathering ingredients by tilling the land and fishing the rivers. You'll learn new recipes and discover new flavours to keep your customers happy. You'll complete mini-games to bring all the ingredients together in delicious dishes. You'll raise a dragon! Little Dragon Cafe is a gentle game with storybook visuals. Its meditative pace isn't calculated to give you a serious challenge so much as a warm glow, so take a load off and crack on with keeping your customers and your dragon happy.